Yes, you heard that right! Kingdom Hearts series director Tetsuya Nomura has finally broken his silence about the mysteries of the very anticipated sequel to Kingdom Hearts II. Thanks to an interview with EGMNow that gaming site Playstation Lifestyle has posted we now know what he has to say about Kingdom Hearts III! To close out the interview Nomura states that he had to “sacrifice my private time, my marriage, my family time” just so he can work on the projects that he can bring to the fans to play. With a concept of Kingdom Hearts III now running in his mind, the question remains with when can we expect an announcement for the game? Stick with us to find out! 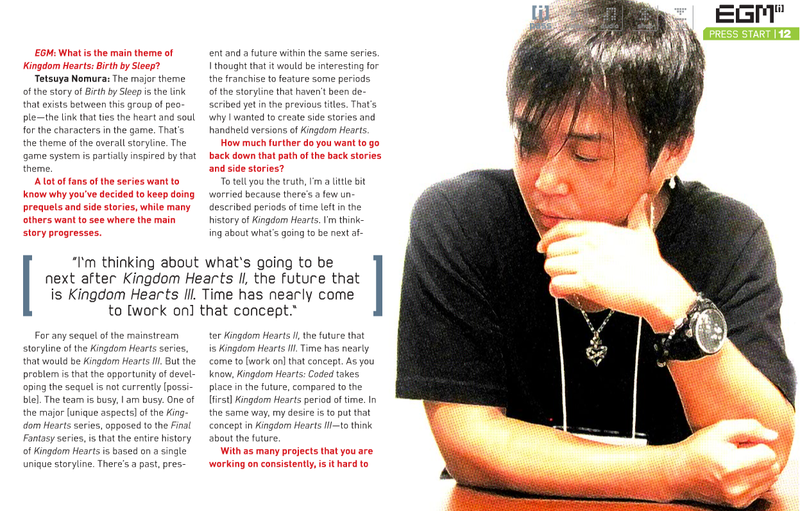 EGM: What is the main theme of Kingdom Hearts Birth By Sleep? 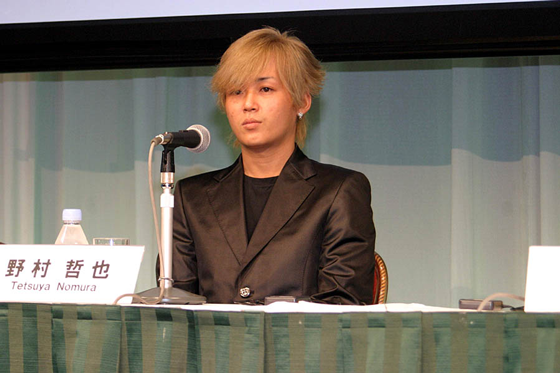 TN: The major theme of the story of Birth By Sleep is the link that exists between this group of people, the link that ties the heart and soul for the characters in the game. That’s the theme of the overall storyline. The game system is partially inspired by that theme. EGM: A lot of fans of the series want to know why you’ve decided to keep doing prequels and side stories, while many others want to see where the main story progresses. TN: For any sequel of the mainstream storyline of the Kingdom Hearts series, that would be Kingdom Hearts III. But the problem is that the opportunity of developing the sequel is not currently [possible]. The team is busy, I am busy. One of the major [unique aspects] of the Kingdom Hearts series, opposed to the Final Fantasy series, is that the entire history of Kingdom Hearts is based on a single unique storyline. There’s a past, present and a future within the same series. I thought that it would be interesting for the franchise to feature some periods of the storyline that haven’t been described yet in the previous titles. 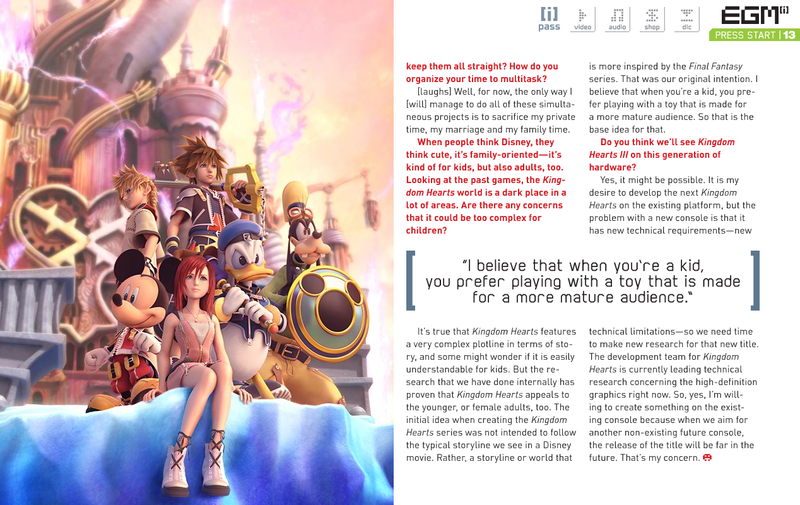 That’s why I wanted to create side stories and handheld versions of Kingdom Hearts. EGM: How much further do you want to go back down that path of the back stories and side stories? TN: To tell you the truth, I’m a little bit worried because there’s a few undescribed periods of time left in the history of Kingdom Hearts. I’m thinking about what’s going to be next after Kingdom Hearts II, the future that is Kingdom Hearts III. Time has nearly come to [work on] that concept. As you know, Kingdom Hearts Coded takes place in the future, compared to the [first] Kingdom Hearts period of time. In the same way, my desire is to put that concept in Kingdom Hearts III, to think about the future. EGM: With as many projects that you are working on consistently, is it hard to keep them all straight? How do you organize your time to multitask? TN: [laughs] Well, for now, the only I [will] manage to do all these simultaneous projects is to sacrifice my private time, my marriage, and my family time. EGM: When people think Disney, they think cute, its family-oriented, its kind of for kids, but also adults, too. Looking at the past games, the Kingdom Hearts world is a dark place in a lot of areas. Are there any concerns that it could be too complex for children? TN: It’s true that Kingdom Hearts features a very complex plotline in terms of story, and some might wonder if it is easily understandable for kids. But the research that we have done internally has proven that Kingdom Hearts appeals to the younger, or female adults, too. The initial idea when creating the Kingdom Hearts series was not intended to follow the typical storyline we see in a Disney movie. Rather, a storyline or world that is more inspired by the Final Fantasy series. That was our original intention. I believe that when you’re a kid, you prefer playing with a toy that is made for a more mature audience. So that is the base idea for that. 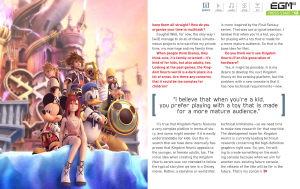 EGM: Do you think we’ll see Kingdom Hearts III on this generation of hardware? TN: Yes, it might be possible. It is my desire to develop the next Kingdom Hearts on the existing platform, but the problem with a new console is that it has new technical requirements, new technical limitations, so we need time to make new research for that new title. The development team for Kingdom Hearts is currently leading technical research for concerning the high-definition graphics right now. So, yes, I’m wiling to create something on the existing console because when we aim for another non-existing future console, the release of the title will be far in the future. That’s my concern.